Once in a while the city life overwhelms me. At those moments I tend to visit the Veerhaven, a place of beauty and silence just a short-distance walk from the Erasmusbrug. The Veerhaven is situated in the Scheepskwartier, a historic neighbourhood barely touched by the war and hence full of old and beautiful buildings. They began digging the Veerhaven in 1852 and completed it in 1854. Since then it is a spot for primarily sailing and other types of historical ships (like schooners and barks). This history is still honoured today by the many restored (sailing)ships that moor the harbour. Ship-owners put in a lot of effort to maintain the ships in their perfect condition so you can enjoy them on a sunny afternoon. In the nineties the harbour was fully restored and brought back to its former glory. 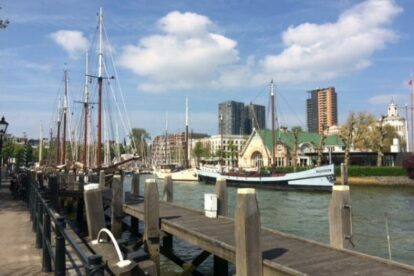 If you want to visit Rotterdam by boat the Veerhaven is a great place to moor for a couple of days. Sit on a bench surrounded by silence and have a look at the magnificent ships, buy an ice-cream in the nearby ice-cream parlour or feast your eyes on the Maas, the lifeblood of the city. The Veerhaven has a lot to offer and is therefore one of my favourite spots in this wonderful city.